Outdoor living is such an important part of the Australian lifestyle, particularly during summer. To ensure you make the most of the warmer months, your home needs a stunning outdoor living space that’s as functional as it is beautiful, a space that’s equally as comfortable hosting a Saturday dinner party, as it is a lazy weeknight wine. Just like you, we love spending time outside and our outdoor living spaces are ingrained in our homes. So we’ve put together six suggestions on how you can breathe new life into your alfresco area. Whether you have a small courtyard or a sprawling deck and pool, there is a way to spruce your outdoor space so you can enjoy outside all summer long. Lighting can make a huge difference to your outdoor living space, transforming it from a plain outside area to an ambient gathering spot. You could weave solar fairy lights through the beams in your roof or string them above the lawn for a garden party feel. A couple of statement pendant lights hanging above the dining table are also a trendy option. Feature floor lamps can add to the vibe of your outdoor area, as can LED lights along pathways, under trees or around the pool. You’ll be amazed at what a little mood lighting can do for your outdoor living space and the best part – it doesn’t have to break the bank. It’s true that timber decking adds warmth and character like no other material, however it is high maintenance. Most timber decks require frequent staining, lacquering or repainting and are time consuming to keep looking schmick. Why not consider replacing your timber floors (or establishing a brand new decked area) with composite decking, which offers the same natural appeal as timber without the upkeep. Using a mixture of plastic and wood, composite decking is sustainable and requires little to no maintenance as it is virtually weather resistant. It’s the perfect choice for time-poor homeowners wanting to make the most of their downtime. Overgrown plants hanging from the rooftop, large pot plants in unused corners, small succulents on side tables – these are all examples of how greenery can be used to add life to your outdoor space. It’s always nice to have a natural theme in an outdoor area and greenery can be a great way break up the monotony of a space, particularly if you have a lot of wooden features. Looking ahead to next summer, you could even consider planting an ornamental grapevine along the roof. This will provide beautiful green foliage and natural shade in the summertime, while the leaves turn a gorgeous red in autumn. If you’ve got everything you need but your outdoor area just isn’t quite there, consider adding some colourful cushions or patterned blankets for a pop of colour. A statement floor rug can also be a great way to instantly transform an alfresco area. Fire pits combine practicality with decoration – a great way to fill in a space between chairs or to replace another table, you can also cook dinner as you sit back and relax. They’re also a winner with kids, who love the novelty of being able to toast their own marshmallows over the flames. If you’re feeling crafty, you could even create a chessboard cover for the fire pit to add fun to daylight gatherings when the pit’s not being used. 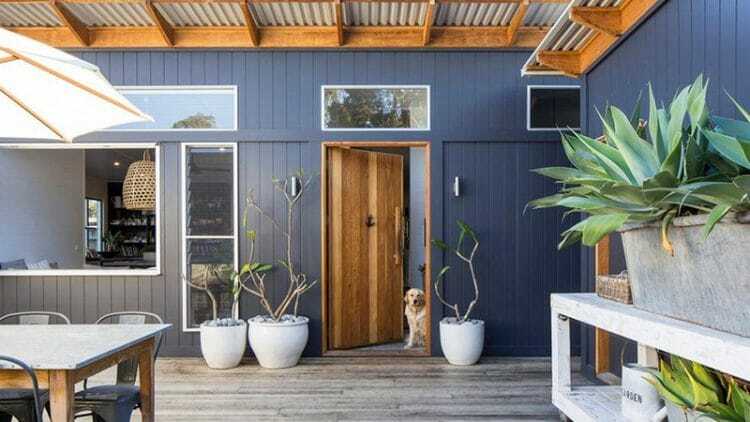 If your outdoor living space needs something further but you don’t want to commit to a complete renovation, why not spend a Saturday on a DIY project. Makeover an old cart or unused dresser, or stack a few old crates to create a cocktail station or mini bar. Give your chosen furniture a coat of paint and top with an ice bucket, some glasses, basic spirits and mixers. Voila! You’ll have a brand new space to whip up concoctions for friends and family on balmy summer evenings. For more ideas on how to get the most out of your outdoor living space, get in touch with Smartbuild South Coast today.